Carbon (C) dynamics are central to understanding ecosystem restoration effects within the context of Grain for Green Project (GGP). GGP stared in China since 2003 to improve the environment. Despite its importance, how total forest ecosystem C stock (FECS) develops following land-use changes from cropland to plantation is poorly understood, in particular the relationship of C allocation to pools. We quantified C pools in a chronosequence ranging from 0 to 48 years, using complete above- and below-ground harvests based on detailed field inventory. Stands were chosen along a succession sequence in managed plantations of Korean larch (Larix olgensis Henry. ), a native planting species in the Lesser Khingan Mountains, Northeast of China. 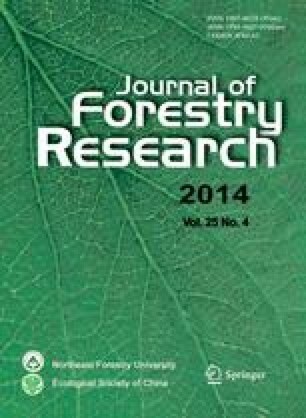 The FECS of Korean larch plantation (KLP) were dynamic across stand development, changing from 88.2 Mg·ha−1 at cropland, to 183.9 Mg·ha−1 as an average of forest C from 7-through 48-year-old plantation. In a 48-year-old mature KLP, vegetation comprises 48.63% of FECS and accounts for 67.66% of annual net C increment (ANCI). Soil is responsible for 38.19% and 13.53% of those, and with the remainders of 13.18% and 18.81% in down woody materials. Based on comparisons of our estimate to those of others, we conclude that afforestation of Korean larch plantation is a valid approach to sequester carbon. Project funding: This research was supported by the Special Public Interest Research and Industry Fund of Forestry (No. 200904003-1), Project of Forestry Science and Technology Research (No. 2012-07), and the Importation of Foreign Advanced Agricultural Science and Technology Program (2008-4-48).